A new national park will help to ease tensions between local villagers and an increasing number of Amur tigers and leopards in Northeast China's Jilin province, according to a senior official from the provincial forestry administration. Xiao Wanjun, deputy director of Jilin Provincial Forestry Bureau's conservation department, said the government will relocate residents and factories away from the protected areas once the boundaries of the park are established, as a way to reduce interactions between these big cats and residents of Hunchun, a small city in Northeast China near the border with the Democratic People’s Republic of Korea and Russia. 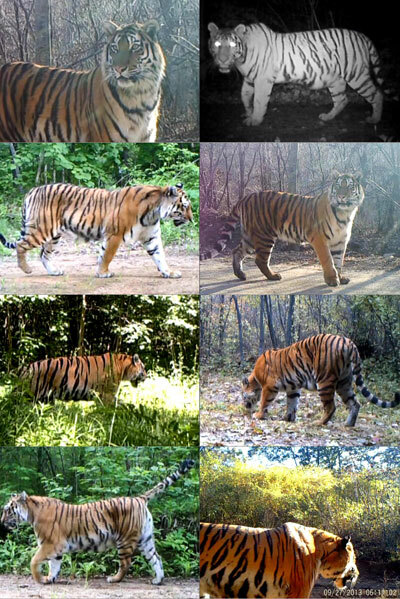 According to a joint research project conducted by Beijing Normal University (BNU) and the provincial forestry bureau, Jilin has a total of 27 Amur tigers and 46 leopards, indicating that the two cats are returning from Russia to Northeast China, including the area around Hunchun. Amur tigers and leopards are occasionally spotted by locals when they appear in villages, eating dogs, sheep, or cows, and frightening farmers. On July 25, a juvenile tiger attacked a local farmer's dog and left nothing but bones behind. Liang Jianmin, publicity director for the Hunchun national reserve, told China National Radio that this is because the young tiger felt hungry and ran down from a nearby mountain upon seeing the dog. "We have to hide our dogs overnight," said Zhou Yamei, a farmer living in a village of Ma Chuanzi township. The 62-year-old farmer said this is the first time he has experienced tigers in this area, and now he is too afraid to pick mushrooms and wild vegetables in the forest. "I'm so scared of them," said Zhou. "The tigers are there, and we can't manage to go." The tension between humans and wild animals is largely due to an oversized population of Siberian tigers and leopards near Hunchun, according to the BNU research team." A Siberian tiger has to take in five kilograms of meat on a daily basis, and a cub needs more and more food to grow up," said Feng Limin, a cat expert on the team. A female tiger uses a territory of 300 to 500 square kilometers, and a male tiger can roam an area twice as large. A big cat will patrol for up twenty kilometers on his or her land in search of prey every day. However, they may need an even larger space now, simply because the low population of deer and wild boar in Hunchun, as reported by Beijing News. "[It] can share space with up to 8 or 10 Siberian tigers, but now the area happens to have more than 20. It's overcrowded," Feng said. So these big cats have expanded their territories into local farms and villages, disturbing residents. Villagers have tried, in vain, setting off firecrackers to scare off the big cats, but failed. "They wouldn't go," said Zhou Changchun, who has been living in the village for all his life. "We can't live together with those tigers." These frequent visitors make Yin Zhaohai feel anxious too, as six cow carcasses, clearly bitten by Siberian tigers, have been found on his contracted farm and nearly 20 more cows have gone missing. The farmers signed an 11-year-long contract with the farm earlier this May, but the frequent appearances of big cats could mean no one will graze cows there. "Tigers are an endangered species, so we can't hunt them. But the safety of cows and humans should also be taken into consideration," Yin said. Over the past decade, farms like Yin's were able to claim compensation from the local government as long as they report their damages caused by wild animals. The forestry department had dealt with 37,000 claims by the end of last year, amounting to 120 million yuan in damages. The Chinese government outlined its plan to introduce a national park system in the 13th Five-Year Plan (2016-2020), as an attempt to protect the country's natural landscapes. A reserve for Jilin's Amur tigers and leopards is one of the pilot programs and will encompass all the confirmed habitats in both Jilin and Heilongjiang provinces. Chang Youde, a senior cat expert at the World Wildlife Fund, said the proposed national park will be 10,200 square kilometers, incorporating Hunchun into another two national reserves. "Amur tigers and leopards are flagship animals, if they were well-protected, Northeast China would have a sound ecological system," said Feng Limin from the BNU team. Relocation seems to be a reasonable resolution to get away from big cats, but it also means a big change for farmers who have called Hunchun home for generations.